The electorate wasn’t sufficiently informed in the 2016 referendum to know whether it was right to leave the EU. 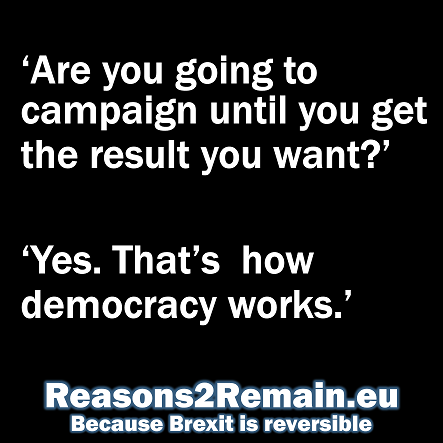 The referendum campaign did not give clear answers. The Leave campaign had to rely on colossal lies to present their case. Who knew what to believe? But now it’s becoming clearer by the day what Brexit means. It means Britain, and Britons, being poorer and having fewer rights and protections than we have as a member nation of the EU. We now know that all the reasons to leave the EU were based on lies, misinformation and false promises. The biggest lie of all – that Britain sends £350m a week to the EU which after Brexit would be spent on the NHS – was the single lie that secured Leave’s victory. So, to think, Leave only won because of one big lie. We are leaving the EU not because of any sound information or knowledge, but because the nation was sold a promise by the Leave campaign which can never be delivered. 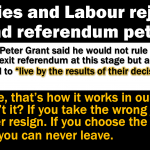 If we knew then what we know now, would ‘Leave’ have won? Almost certainly not. We are now discovering there are absolutely no benefits to Brexit. None. Zero. But neither the Tory government nor the Labour opposition are willing to give us, the people, a chance to reconsider Brexit, even though we’re now so much better informed. It’s as if we agreed on one hot summer’s day to buy double-glazed windows, only to discover that we can’t change our minds, even though the contract hasn’t yet been signed, the windows haven’t yet been installed, and we’ve now found out that the glass is single and not double glazed. Am I saying that Britain has been conned? Yes, I am. But legal advice, and the opinion of leading EU politicians, have now confirmed that Britain could withdraw the Article 50 notice and remain in the EU. I’m not suggesting we should do this without the say-so of us, the people. But we should demand another vote on our EU membership. We could do a democratic U-turn on Brexit. And if that’s the new ‘will of the people’, why not? 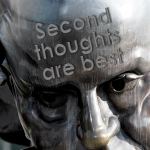 All of us should be allowed to change our minds if we think a mistake has been made. 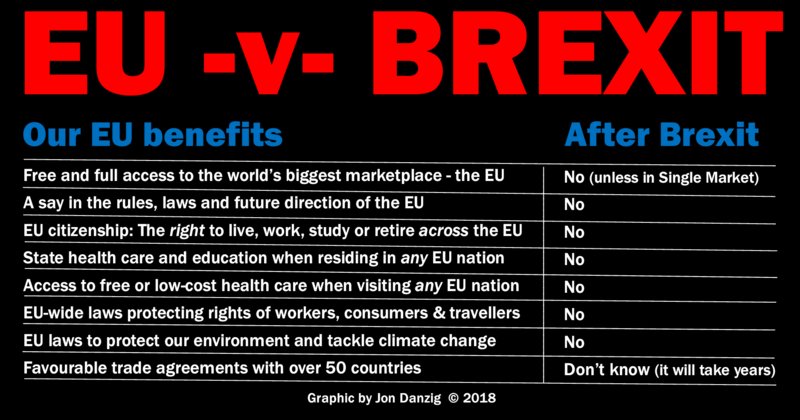 Just look at all the benefits we’re destined to lose on leaving the EU in March next year. How many of us knew or properly understood that on 23 June 2016? In the EU, the UK enjoys full free trading status with all the other EU member states – representing the world’s most lucrative market place, and by far our most important trading partner. As such, almost half of our exports go to the EU, and over half of our imports come from the EU. The EU has an iron tariff wall against non-members. Outside of the EU, we will be on the wrong side of that wall. Even non-European countries that have negotiated ‘free trade’ agreements with the EU don’t enjoy full free trade access to Europe’s internal market, as Britain does as an EU member. As a leading member, Britain has a say – and a veto – in the EU. Britons also have a vote every five years to directly elect members of the European Parliament, which democratically passes the laws of the EU. As an ex-EU member, Britain and Britons will lose the right to have any say or vote in the running or future direction of our continent. Leaving the EU means we will lose the right to go and live, work, study or retire across all of the EU plus Norway, Switzerland, Liechtenstein and Iceland. And citizens from the rest of the EU will also lose the right to come here to live and work, making it much more difficult to fill key vacancies, both skilled and unskilled, for which Britain has a chronic shortage of workers. EU laws protecting the rights of workers, consumers and travellers across our continent are probably among the most important EU membership benefits. For example, 4-weeks paid holiday a year; the 48-hour working week; anti-discrimination law; guaranteed rights for agency workers; guaranteed worker consultation – all of these protections largely exist because of the EU. No single national government can assure safety and protection across our continent. It needs the reach of a pan-European intergovernmental organisation to achieve that (albeit with the democratic consensus of member states). When we lose the strong armour of EU employment law, workers’ rights will be at the mercy of a Conservative government. Anyone who believes they would then be in safe hands may be in for a rude shock after we leave the EU in March 2019. Britain enjoys cleaner beaches as a direct result of EU directives on protecting the environment. In addition, the EU is leading the world in tackling climate change – something that individual countries alone simply can’t undertake. When Britain leaves the EU in March 2019, we will lose the benefit of EU-wide legislation to protect the very air we breathe. The Supreme Court unanimously ruled that the British government must make plans to clean our air, in accordance with the EU air quality directive. The case only came about when an environmental pressure group took the government to court, because tens of thousands of British residents die every year as a result of our polluted air. Would the government bother to act without the legal protection offered to us by the EU? It’s unlikely. After Brexit, the government is proposing to take away the rights of British citizens to sue them over issues such as workers’ rights, environmental policy and business regulation. This right to sue our government is something we currently only enjoy under EU law. Because the EU is the world’s richest, biggest market-place, and the world’s biggest exporter and the world’s biggest importer, it can negotiate the best trade agreements with other countries. It’s often said that when negotiating, you get better deals if you’re the same size or bigger than your opposite number. As one of the world’s biggest economies, the EU has the muscle to negotiate extremely favourable trading terms with the world’s nations, and has done so with over 50 countries so far (including one recently with Canada). Could Britain, being much smaller than the EU, achieve similarly good trade agreements with the world’s countries? It’s unlikely, but in any event, it will take many years to find out after we have left the EU in March 2019. ► If you believe that Brexit is a mistake, it’s time to speak up, loudly and clearly, before we leave the EU at midnight on 29 March 2019 and take a one-way ticket into the unknown. 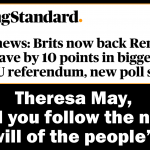 ► If you’re one of the 17 million who voted for Brexit but have now changed your mind; if you’re one of the 16 million who voted against Brexit; if you’re one of more than 30 million who didn’t or couldn’t vote and are against Brexit: it’s time we let our political masters know what ‘the people’ really want. 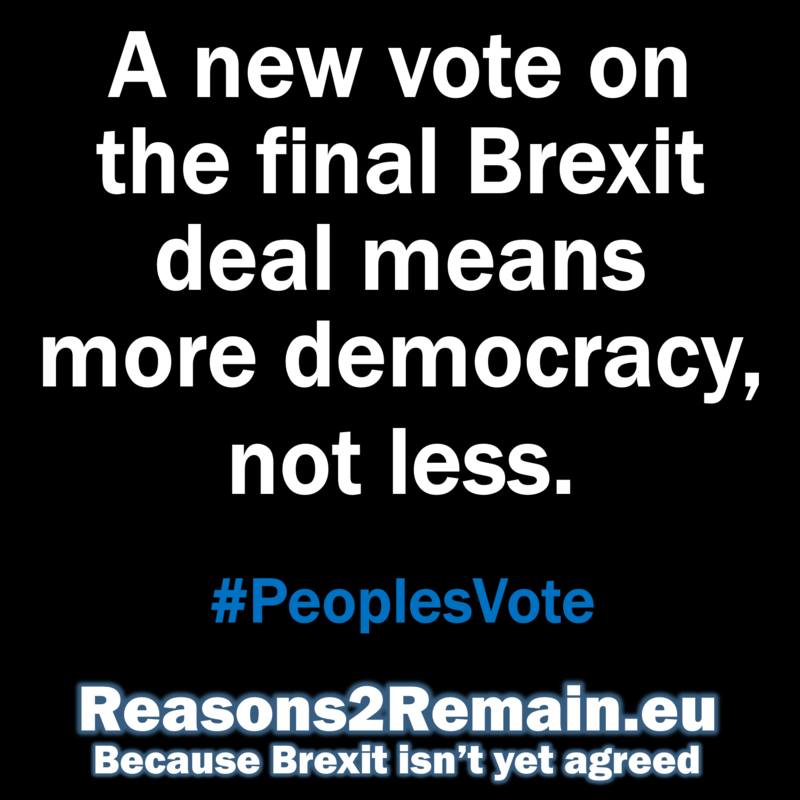 This entry was posted in Current Affairs, Democracy & Citizenship, Politics & Public Policy, The EU, Uncategorized and tagged Article 50, brexit, EU benefits, EU referendum, European Union. Bookmark the permalink.